Photo by Lady Ducayne / Flickr Creative Commons. There’s no question getting riders from point A to point B efficiently is a key part of Metro’s mission. Most of the time, that means getting riders to and from home, work or school. But what about points C, D and E and your other destinations throughout the day? Metro reaches a lot of places and neighborhoods. That’s why we’ve recently listed the best transit adjacent places to satisfy your sweet tooth and where to find the best caffeinated pick-me-up. Now, we look to the happiest of hours and spotlight nine of the most transit convenient places to grab a bite and maybe a beverage or two with colleagues and/or friends after work. There’s no doubt the list could be much longer as there are countless bars and restaurants near Metro worth visiting. To pick these nine, we weighted proximity to transit and happy hour deals, as well as added a few other nearby honorable mentions. So if you have a favorite that fits the bill that we didn’t mention — whether it’s super transit accessible and/or offers a spectacular happy hour menu — feel free to let us know in the comments below. Because when it comes to the best happy hours near transit, sharing is caring. The almost two-year-old Greyhound Bar and Grill in Highland Park offers a solid happy hour with $4 dollar draft beers and well drinks as well as offering some gastropub favorites such as loaded fries and chicken (or veggie) wings with drink combos. Though the baseball season is over, they’re also a good place to watch the Dodgers with specials during games. How to get there: Metro Gold Line to Highland Park Station, upon exiting station walk southeast toward Figueroa St. Take a right on Figueroa and walk about two blocks. Greyhound Bar & Grill will be across the street at Avenue 56. Happy Hour: daily, 4 p.m. – 7 p.m.: $4 all drafts & well drinks, $3 dollar off wine, $6 dollar loaded fries, food + beverage combo specials. La Cuevita (map): a generous happy hour from 5 p.m. – 9 p.m. features $5 dollar cocktails, $3 PBRs and $5 Scrimshaw. Sure, they don’t officially have a happy hour, but the Stone Company Store’s location can’t be beat — it’s literally adjacent to the Gold Line platforms. The store features a variety of standard and funky beverages on tap from Escondido’s Stone Brewing Company. 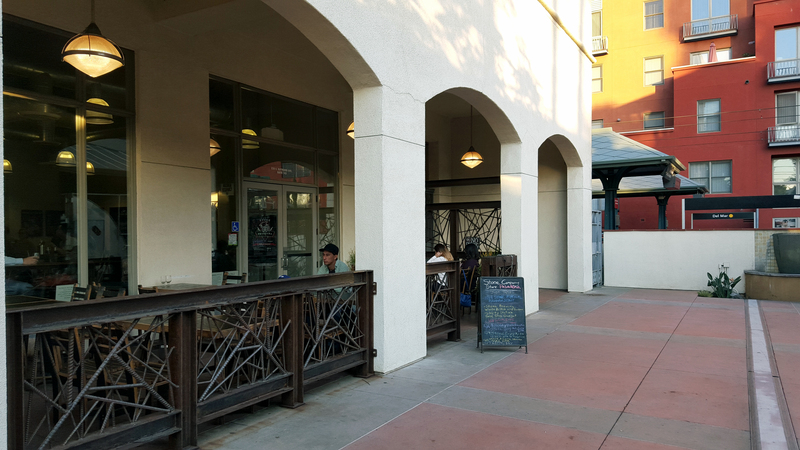 If you absolutely must have food during happy hour, the Luggage Room (mentioned below) is next door and there are a ton of places to nosh in Old Pasadena. How to get there: Metro Gold Line to Del Mar Station. The store is located in the plaza adjacent to the Atlantic-bound (southbound) train platform. Happy Hour: None. But you just can’t beat it for quality and transit accessibility. Luggage Room (map): also in the same plaza as the Del Mar Station, the pizzeria’s happy hour is from open until 7 p.m. and features a wide variety of drinks at $6, including their “slushy” drink. Congregation Alehouse Pasadena (map):“mass” menu all day Monday, T – F 3 p.m. – 7 p.m with $4 beer of the day, $1 off other drinks, and $2 off all appetizers. Congregation also has a transit proximate downtown Long Beach location and another a block south of the Downtown Azusa Gold Line Station opening on March 5. Curveball! 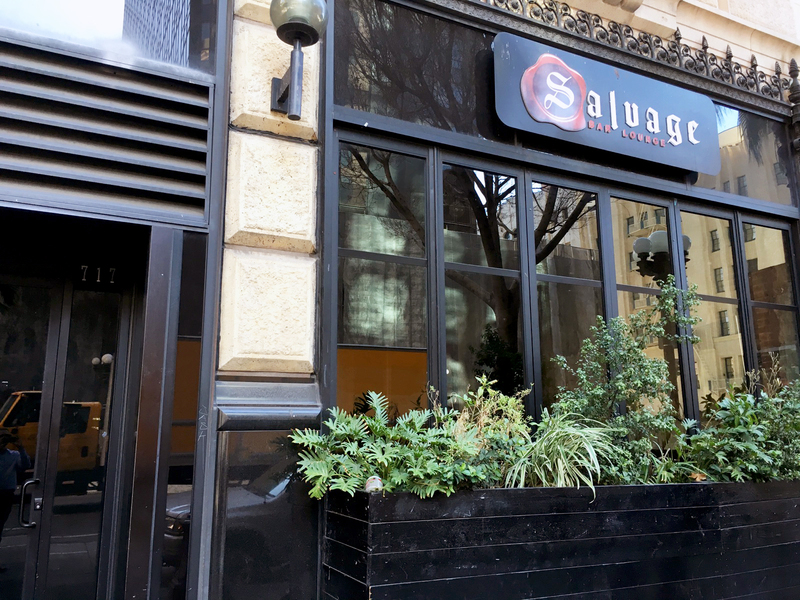 Don’t expect to see Salvage show up on any prestigious foodie lists. But what Salvage lacks in local prestige, it makes up for its proximity to transit and affordable happy hour prices. The bar, located on 7th Street between Hope Street and Flower Street, is usually loud and crowded on any given Saturday night, but during the week it keeps a low-key lounge vibe. There’s seating for small groups in the back as well as a small patio outside. How to get there: Metro Blue, Expo, Red or Purple Line to 7th Street / Metro Center Station. Use the Hope Street exit and take a right to walk west on Seventh Street. Cole’s (map): a shorter walk from the Metro Purple/Red Line Pershing Square Station. It’s an obvious pick and a classic downtown establishment. French Dip combos and drink specials run 3 p.m. – 7 p.m. M – F and all day Tuesday. Plan Check (map): a little bit of a walk up and over the 110, but this location boasts an impressive food and drink happy hour menu from 4 p.m. – 7 p.m M – F. Baked oysters anyone? You shouldn’t let the mediocre Yelp reviews get you down on Big Wangs in NoHo. It’s a sports bar so you need to curb your expectations a bit. Still, the bar and restaurant gets the trifecta for a decent selection of bar food and drinks, happy hour specials and transit accessibility. 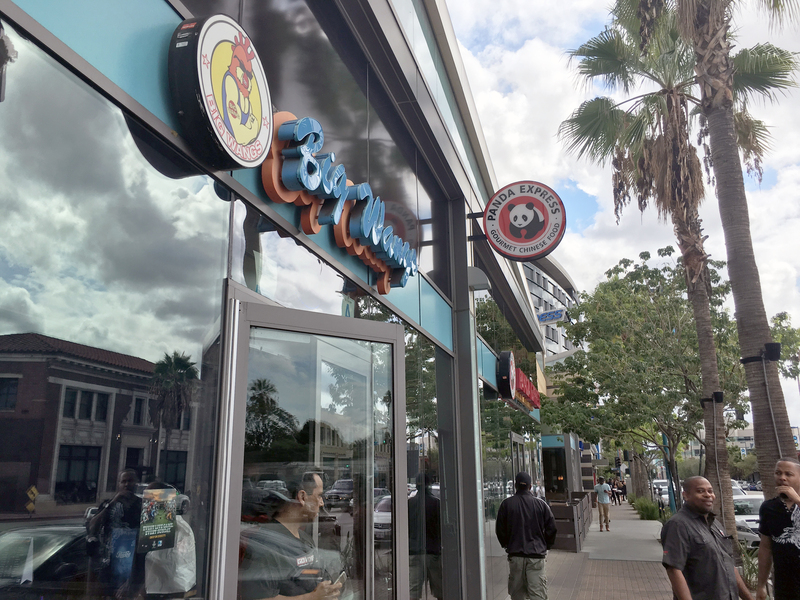 It’s located directly across the street from the Metro Red Line Station and offers daily and weekly specials and two daily happy hours, though prices get a little steep outside of special times. And with no shortage of televisions, it’s also a solid choice for sports fans looking for a convenient place to watch the game after work. How to get there: Metro Red or Orange Line North Hollywood Station. Walk south along Lankershim Boulevard after exiting station and cross Chandler. The restaurant will be on your left. Happy Hour: M – F: 3 p.m. – 7 p.m.: 7 days a week: 10 p.m. – close; daily and weekend sports specials. 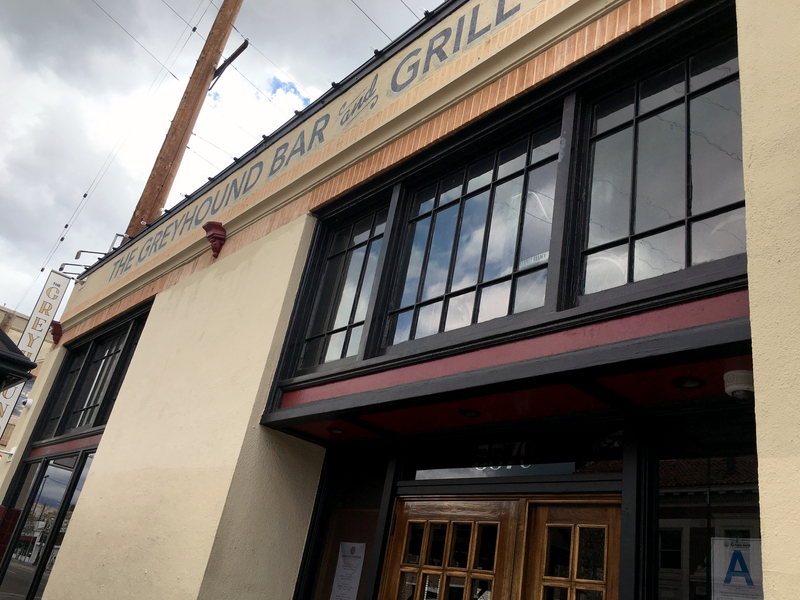 District Pub NoHo (map): gourmet sausages and burgers, rotating taps and happy hour M – F 2 p.m. – 7 p.m. Choosing the best transit-oriented happy hour in Culver City was tough. With a handful of gastropubs clustered in downtown Culver City, competition is stiff. 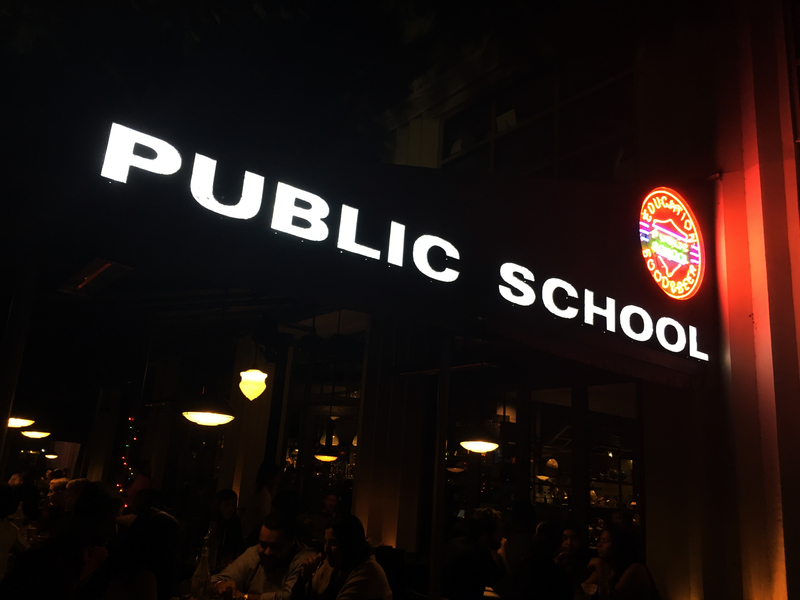 Alas, Public School 310 is a Culver staple with an extensive food and beverage happy hour –err, “recess” — menu and unlike some other worthy happy hour locations (looking at you Backstage Bar & Grill) isn’t too much of a walk from the Expo Line Station. The tots are transcendent. How to get there: Metro Expo Line to Culver City Station. Exit toward Venice Boulevard and take a left. Walk one block, cross Culver Boulevard and veer to the left. Walk twos blocks and cross Bagley Ave. Restaurant will be on the right. Backstage Bar & Grill (map): yes, it’s about a 20-25 minute walk from the Expo Line station, but Backstage’s prices and fun atmosphere can’t be beat. 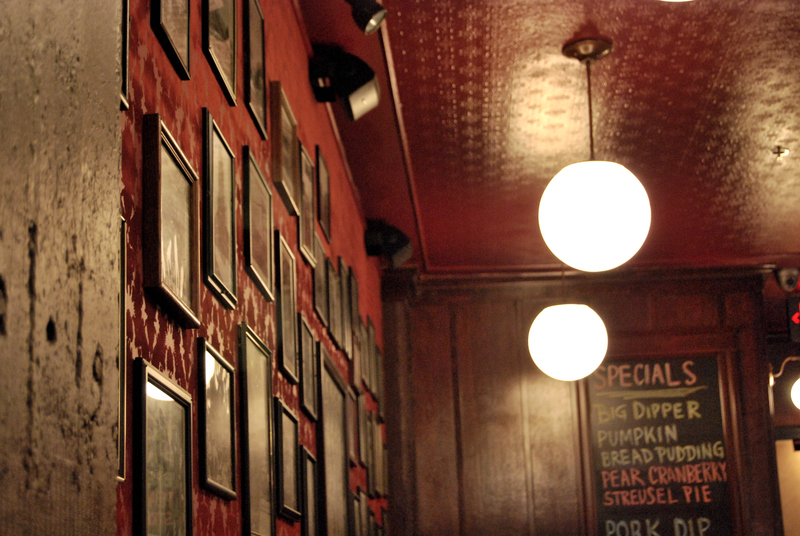 There are daily specials as well as happy hour every day from 4 – 8 p.m. with discounts on an array of pub fare. Father’s Office (map): no happy hour, but it’s super close to the Culver City Station and has good food and beer. For those looking for something more filling after work, take a walk a block north from the Wilshire / Western to Beer Belly. They’re known for their burgers and other delicious — though heavier — fare like duck french dip and grilled cheese with bacon and maple syrup. If that sounds like a lot to handle, they offer happy hour portions of their duck fat fries and Jidori hot wings. For drinks, there’s a rotating draft list of about a dozen beers as well as a menu of craft cans and bottles, wine and craft sodas. How to get there: Metro Purple Line to Wilshire / Western. Walk straight when exiting station from the escalator. Restaurant is one block down on Western (past Sixth Street) and on your right. EMC Seafood & Rawbar (map), you’ll want to exit at Purple Line – Wilshire/Normandie. The happy hour from 5 – 7 p.m. is most known for its quality $1 oysters and $5 draft beers. A favorite amongst the downtown nine-to-five crowd, Far Bar’s choice of beers, delicious Asian fusion happy hour appetizers, and the ability choose-your-own ambience between the front, back bar and patio make it a worthy transit-oriented happy hour destination. You can’t go wrong with their wasabi fries, either. How to get there: Metro Gold Line to Little Tokyo / Arts District Station and cross Alameda St. Continue walking for about a block. Restaurant is on the north side of the street. Happy Hour: M – F, 3 p.m. – 7 p.m.: Sunday – Monday 9 p.m. – close; $4 – $5 happy hour food menu; $7 cocktails, $5 wines, $5 beer of the day, $3 Sapporo. Metro riders save 10% off food bill with TAP card. 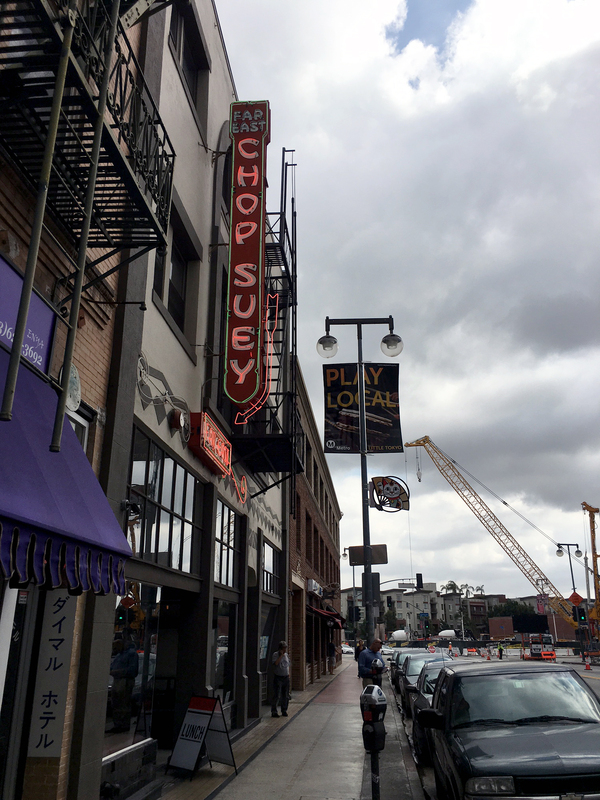 Wolf & Crane (map): located on 2nd Street, happy hour features $5 drink deals. The general drink list here features extensive whisky options. For food, visitors can order Pitfire Pizza and have it delivered for a $1 fee. Angel City Brewery (map): the only official brewery in downtown L.A. No official happy hour but prices are reasonable for craft beer. The space is large and great for groups. Outside food is welcome and food trucks rotate daily dishing out everything from dumplings to bison burgers. 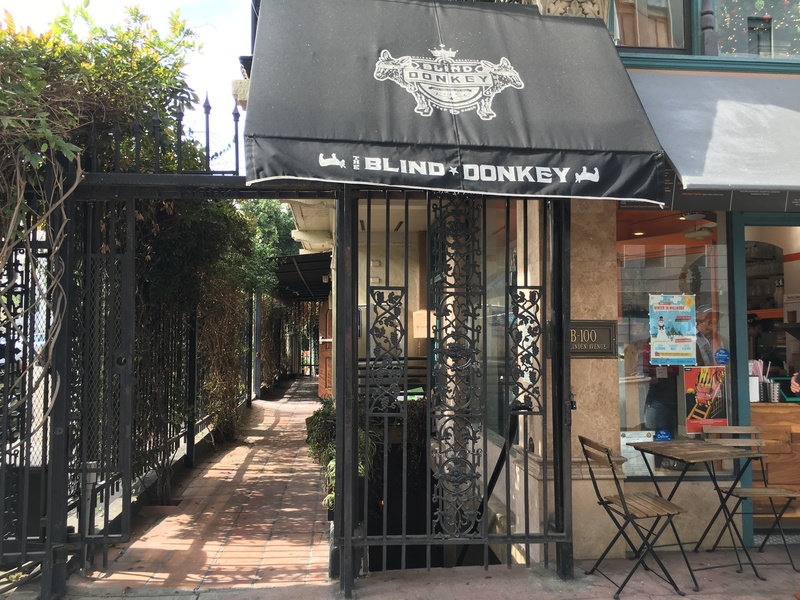 The Blind Donkey in Long Beach is just a short walk from the Blue Line in the East Village neighborhood. The underground bar features an extensive whiskey menu, but the happy hour and the vibe’s not bad either. For the bar-sportsing type, there are arcade games, shuffleboard, darts and pool. No food here, but you can have food delivered or bring in your own. How to get there: Metro Blue Line to 1st Street Station. Walk east on Broadway for a few blocks to Frontenac Court. Continue walking and the bar will be on your right. Happy Hour: M – F, 5 p.m. – 8 p.m.: Saturday – Sunday 5 p.m. – 7 p.m.; $4 select drafts and wells. Pike Restaurant & Bar (map): a little further outside of DTLB, but to get there is relatively comfortable bike ride along 4th Street. There are plenty of food and drink options. A little on the earlier side, happy hour is 2 p.m. – 6 p.m. with $3 domestic drafts, wells and appetizers. Congregation Ale House (map):“mass” menu all day Monday, T – F 3 p.m. – 7 p.m with $4 beer of the day, $1 off other drinks, and $2 off all appetizers. First of all, let me disclaim: Hollywood, particularly the area along Hollywood Blvd., is known neither for being cheap or authentic. 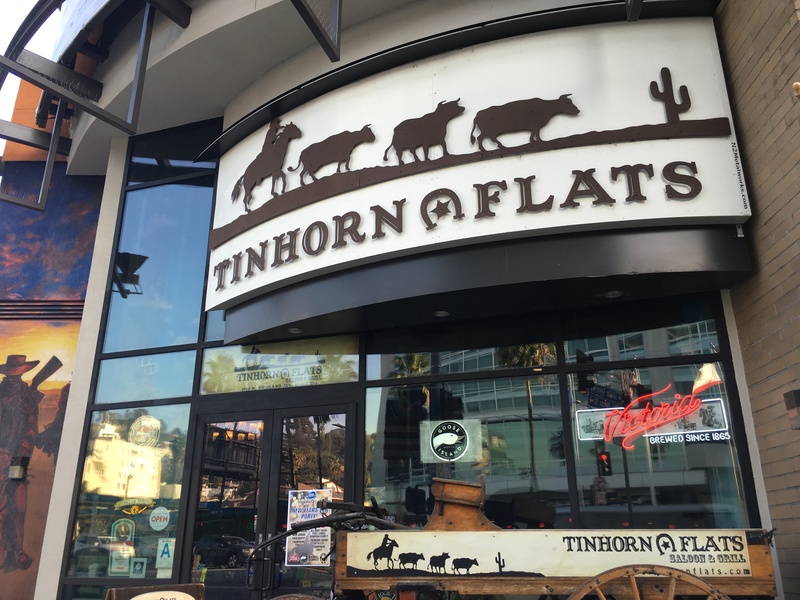 With that said, Tinhorn Flats is nothing fancy and perhaps a little gimmicky, but it does hit the transit happy hour sweet spot. 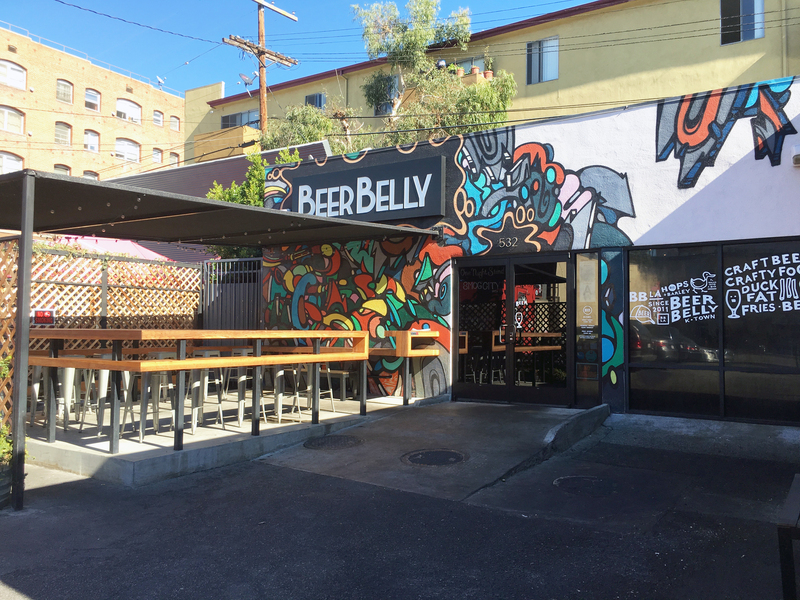 It’s less than a block north of the Hollywood / Highland Red Line Station and offers a host of happy hour and daily drink and food specials like $3.50 IPA Wednesdays. Yes, you may have to rub elbows with tourists, but with happy hour offerings like that, you can’t write it off for an after work visit. How to get there: Metro Red Line to Hollywood / Highland. Walk east to cross Highland Ave., then turn left to walk a half-block north. Piano Bar (map): take the Red Line and exit at Hollywood/Vine Station. The draw here is usually the live music later in the evening, but their happy hour isn’t bad at all. It runs from 5 p.m. – 8 p.m. with $4 wells, wine and beer. The Well (map): another excellent option near the Hollywood/Vine Station. Happy hour is 4 – 8 p.m. weekdays, 5 p.m. – 8 p.m. weekends. The Well has a two page happy hour menu that starts with $3 select beers, $6 hour wines, and 6.50 martinis and cocktails. Order a drink for select appetizers at a discounted price. That’s our list. So tell us: what happy hour gems did we miss? For a list of Metro Destination Discount partners that offer special discounts to TAP card holders, click here. Chatsworth has many options as well! Los Toros, McGee’s, and the Cowboy Palace are all within walking distance from the Chatsworth Orange Line and Metrolink Station. Beachwood Brewing in Downtown LB has an awesome Happy Hour!